Dental care is an important piece of your dog or cat's preventive health care program. Good dental hygiene can increase your pet's health, vitality, and well-being, and add additional years to his or her life. Regular dental check-ups and teeth cleanings help ensure that your pet leads the best life possible and also helps minimize the lifetime cost of care for your pet. If left untreated, dental disease can not only be painful and inhibit proper nutrition, but it can also lead to serious systemic issues that may threaten your pet's health before symptoms are noticeable. For example, oral bacteria that enter the bloodstream can damage your pet's kidneys, heart, brain, or liver. It is estimated that more than 80 percent of dogs and 70 percent of cats develop tooth and gum disease by the age of three years. The veterinarians and medical team at The Village Animal Clinic are concerned about the dental health of your pet. That is why our veterinarians and staff members have completed multiple hours of continuing education and hands-on training in veterinary dentistry. Dr. McCarthy, Dr. Cheever, and Dr. Hellreich and their staff believe that the centerpiece of good dental care is a complete oral exam followed by a thorough cleaning. Dental cleanings include ultrasonic scaling followed by polishing and an antiseptic mouth rinse, the combination of which is designed to remove plaque and slow its buildup. 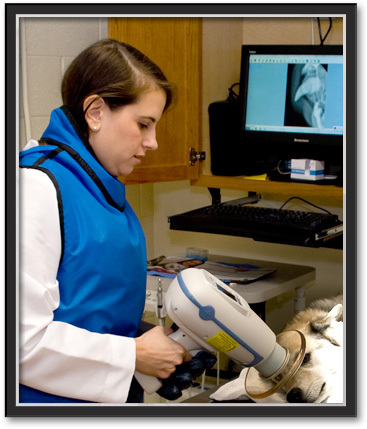 The Village Animal Clinic offers digital pet dental radiology, which produces high-definition images of your pet's teeth. More accurate than traditional radiology, digital dental radiology produces clear images of the area below and above your pet's gum line in order to diagnose dental disease that cannot be seen by visual examination alone. This is a powerful tool for enabling the treatment of dental disease before it becomes much larger and more difficult and expensive to treat. 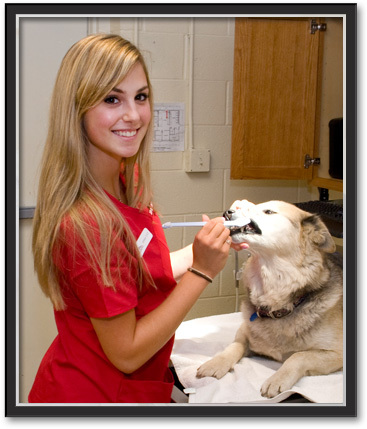 Our Albany area veterinary staff is dedicated to educating you about the importance of your pet's dental health. The home care products we offer are carefully researched and selected for optimum health benefits. Our dental technicians are well educated and highly trained in dentistry and we take great pride in the services we provide. Preventing periodontal disease by keeping your pet's teeth and gums healthy isn't just a job for your veterinarian; it's your job too. While nothing can take the place of regular visits to The Village Animal Clinic for checkups and cleanings, ongoing follow-up oral care at home is just as important in controlling plaque and tartar formation. Brushing your pet's teeth is best started at a young age, before the adult teeth erupt. The younger the animal is, the more likely he or she is to accept it. Regular brushing not only keeps your pet's teeth clean and healthy, it also enhances the bond between you and your pet. If you are unsure of how to brush your pet's teeth, please ask a staff member at The Village Animal Clinic for instructions. We are happy to instruct and/or demonstrate to you the best and easiest method. Also, please remember to always use tooth paste specifically made for pets, not for people.